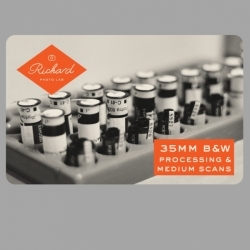 DISCLAIMER: You may use this card by presenting it for payment when sending in film to Richard Photo Lab. This is not a credit/debit card and has no implied warranties. Richard Photo Lab is not responsible for lost, stolen or damaged cards. Card is redeemable for purchases only. Card value must be used in its entirety on one purchase. If the full list of services included with the value of this card cannot be completed due to issues with your film, the equivalent value of unfulfilled services will be applied as a credit towards future services at Richard Photo Lab. Beginning January 1st, 2019, card redeemable for services worth original retail value of $32.00.